API Service Classification SN PLUS, Resource Conserving; ILSAC GF-5. Supreme 7000™ Synthetic 5W-30 Plus provides extra protection during stop-and-go driving conditions and is recommended for gasoline fueled automobile and light duty truck engines (including turbocharged and supercharged engines). 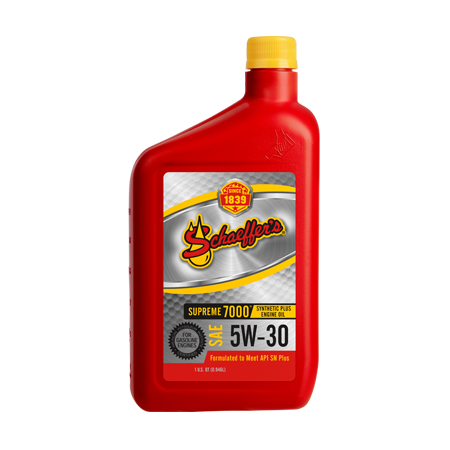 Our 5W-30 is a multi-grade gasoline oil engineered with the finest quality, severely hydrotreated polyalphaolefin (PAO) synthetic based fluids and solvent refined, and severely raffinate hydroconverted Group II Plus. This unique blend creates a premium, longer lasting oil that withstands a higher heat range than conventional oil. Using proprietary friction modifiers, Micron Moly® and Penetro®, Supreme 7000™ Synthetic Plus 5W-30 quickly plates to metal surfaces, creating a slippery, tenacious shield that prevents metal-to-metal contact. By reducing friction and wear, Supreme 7000 Synthetic Plus 5W-30 protects critical engine parts and increases engine efficiency, engine life and fuel economy. Supreme 7000™ Synthetic Plus keeps engines exceptionally clean and free from oil residue and sludge, allowing the oil to flow freely and lubricate properly. For extra protection in cold weather, our 5W-30 engine oil offers superior cold cranking and oil pumpability at low temperatures. Reduced timing chain and valve train wear. Mitigates against low-speed pre-ignition (LSPI). Improves engine durability without sacrificing fuel economy. Exceptional oxidative and thermal stability, especially at high temperatures. Rapid circulation and pumpability in lower temperatures to minimize wear during start up. Extended oil drain capability and intervals. Enhanced detergency and dispercency to prevent and control sludge, deposits and varnish.